Escape to the Moroccan Sahara Desert for a Safari Visit Morocco's South and desert region. Explore Ait Ben haddou Ksar and Kasbah Telouet. Go back in time and travel through the Draa Valley region. Venture by pise through the old road of the caravans. Discover a region that once had Moroccan pirates raid caravans for dates and other valuable old world goods. Visit Skoura and the Valley of One Thousand Kasbahs. Bask in the Valley of Roses and if traveling in April see first hand the crowning of the Rose Queen. Travel to the Dades Valley and sip tea with Nomads in Caves. Take a Sahara Desert Safari in the Erg Chebbi Dunes. 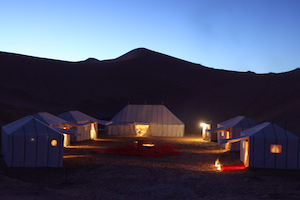 Trek in the Sahara desert to an Oasis and experience an 1001 Arabian Nights dinner and music experience in the heart of the dunes under the Moroccan stars. Have lunch and bake bread with a Berber family on volcanic rock. Partake in your own private henna party. All of these activities can be done with one week in Morocco or more! Go Coastal to the Artist Colony of Essaouira Explore this Portuguese fishing village that is full of charm with its old ramparts, art galleries and glorious sunsets. Explore the Jewish Mellah, the blue washed doors, Orson Welles square and the numerous outdoor grills where you can have fresh fish with seaviews. Old Mogador is the ideal place for relaxation on a Honeymoon in Morocco. It's laid back atmosphere, gentle local population and Moorish architecture make for the charmed experience. 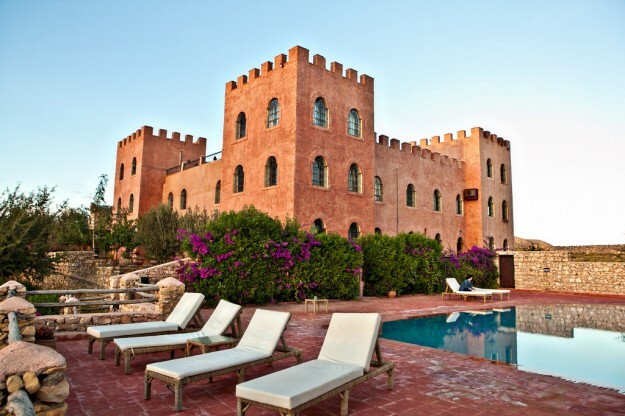 For honeymooners who want to venture outside of the Essaouira medina walls there is the beach of Sidi Kaouki, Ranch of Diabat and Moulay Bouzerktoun all less then an hour by car. Essaouira also offers day trips for honeymooners to a local Frommagerie and a winery for an afternoon filled with lunch and wine tasting. 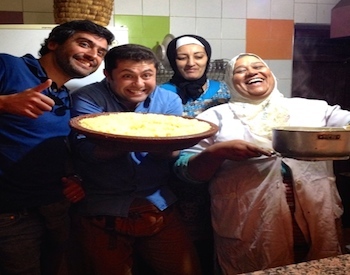 Exotic Eats in Mararkech and Fes with Savory Food Tours Honeymooners in Morocco are guaranteed an exotic foodie experience of savory delights. A Food Tour in Marrakech and a Food Tour in Fes are two options for afternoon or evening exploration of what the locals eat. 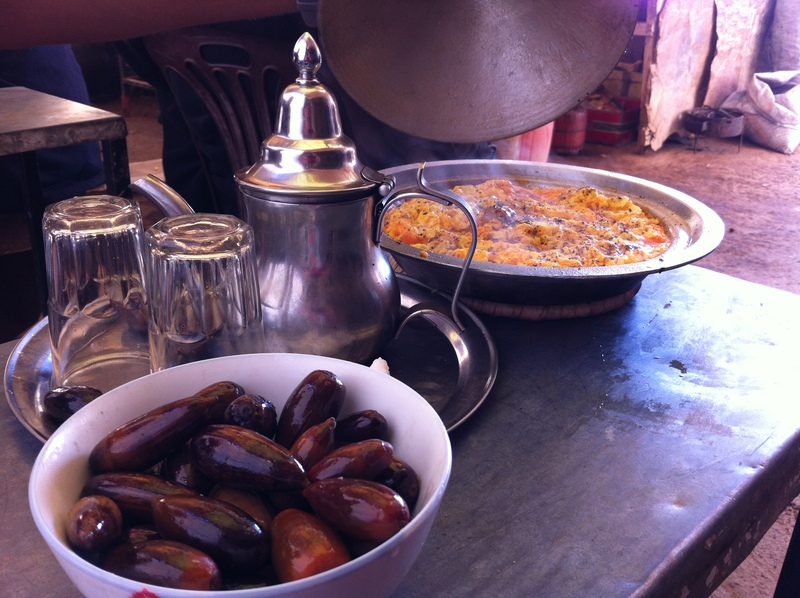 Eat your way through Morocco on a Marrakech Food Tour. Discover the world of spices and their uses and the secrets of the tea den under the guidance of a culinary leader and story-teller. Or learn to bake bread in the 400 year old community oven with the baker overseeing your hands-on efforts. Take your hot bread to the honey souk to try it with 8 artisanal wild honeys, aged butter or khlia, spicy dried beef. You might try cooking ‘on-street’. Shop and fill up a terracotta urn ‘tanjia’ to have embedded in the hot ashes of the furnachi for a rich and spicy Moroccan casserole. Try Moroccan harira soup, sardine meatballs, two varieties of lamb, smoothies, a Moroccan doughnut, simmering hot mint tea or a local sweet and more! 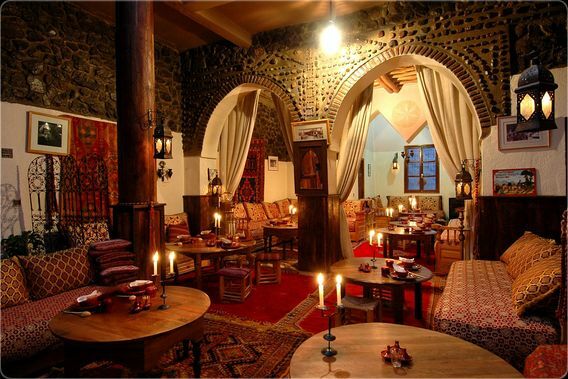 A Mountain Hideaway in the Middle of the High Atlas Honeymoon in Morocco at a mountain hideaway in the Atlas. It's something that you will not regret. Richard Branson's Kasbah Tamadot is idea for honeymooners that want a secluded experience with top end luxury. 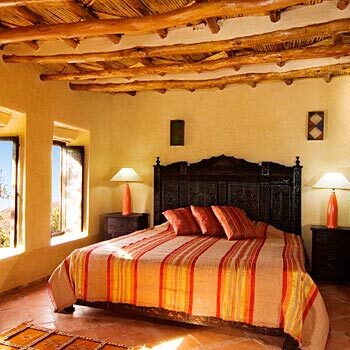 For more down to earth honeymooners the option to stay at Kasbah Toubkal or Dar Imlil, two other secluded properties nestled in a region of Berber villages can provide for an authentic stay. Morocco's High Atlas offers trekking experiences. Honeymooners can summit Kasbah Toubkal, the second highest mountain to Kilamanjaro or simply hike in and around the mountains. 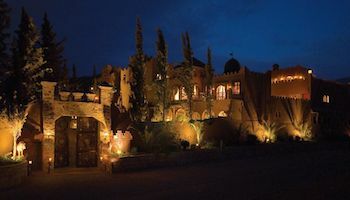 On a mountain hide away adventure your private day trip will allow you to venture into Berber Village by foot and lunch by candle light with a Berber family in their mountain home. You can visit a village of weavers and learn how lcoal carpets are made. Get the Royal Treatment in a Moroccan Hammam The perfect Honeymoon in Morocco is not complete without the Royal treatment at a Moroccan hammam.Moroccans from all walks of life use hamams as a method of self-cleansing or as a social event. During your visit make sure to carve out time to spend an afternoon taking in this traditional Moroccan experience. 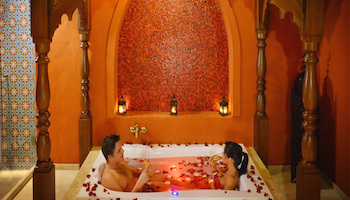 At a Moroccan hammam you can have a royal massage with argan oil and orange or rose water. Almond oil rubs and other essential oils will be used. Your scrub down at a Moroccan hammam will remove all of the dead skin and wipe away the past. Both sides of your body with a rough flat glove called a kiis. If you find this a little invasive, then you can bring your own kiis. Royal Moroccan Hammams can be enjoyed at La Mamounia, Heritage Spa, La Maison Arabe, Le Bains Des Marrakech or even your Moroccan Riad. The bustling red terracota colored city of Marrakech is dotted with magnificent views of the High Atlas Mountains and surrounded by lush valley's and a desert-like palmeraie. Marrakech is the perfect city to use as a base for Day Trips. Often referred to as the Paris of Morocco, the city of Marrakech is well appointed in Morocco's south. Mararkech is just three hours from Morocco's Atlantic coast and the Essaouira Medina, an hour from the Ourika Valley and a full days drive from the Sahara Desert. Consider taking a one week holiday in Marrakech as to allow for these various Moroccan Day Trips. A favorite weekend getaway for Marrakech's is the Ourika Valley. This quaint region is appeciated by locals for its valley's, streams and the seven Setti Fatma waterfalls. Ourika is perfect for long walks, hiking, visiting a Berber villages and is filled with palm tree plantations, fruit trees, tiny hamlets, summer homes and road side cafes. Travelers can enjoy tea and break bread with a Berber family on this day trip from Marrakech. For those looking to experience off the beaten path Ourika consider exploring the charming Berber vilage of Ait Ashok. Nestled in a secret location inside the Ourika Valley and not frequented by many travelers, it offers unforgettable views, authentic encounters, and an unclose experience to meet local villagers of of Tizi Oucheg. Ourigane Valley Nestled in the High Atlas Mountains of Toubkal National Park, this region is a must see for travelers interested in a low key, non touristic day trip from Marrakech. Ourigane Valley is ideal for relaxing and hiking. It's various flora and fauna makes for the idea location to sip mint tea with a view. The Ourigane VAlley also home to one of Morocco's oldest Jewish Zaouia sites, the shrine of Rabbi Abraham Ben Hammou. Ourigane boasts fresh Atlas air and small properties for longer stays such as the classic La Roseraie famous for it's 30 hectares of rose gardens and stables and the new, contemporary Hotel L'Amandier. 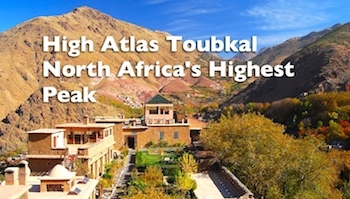 The High Atlas Toubkal Mountains are the second highest in Africa second to Kilamanjaro and the highest peak in North Africa. 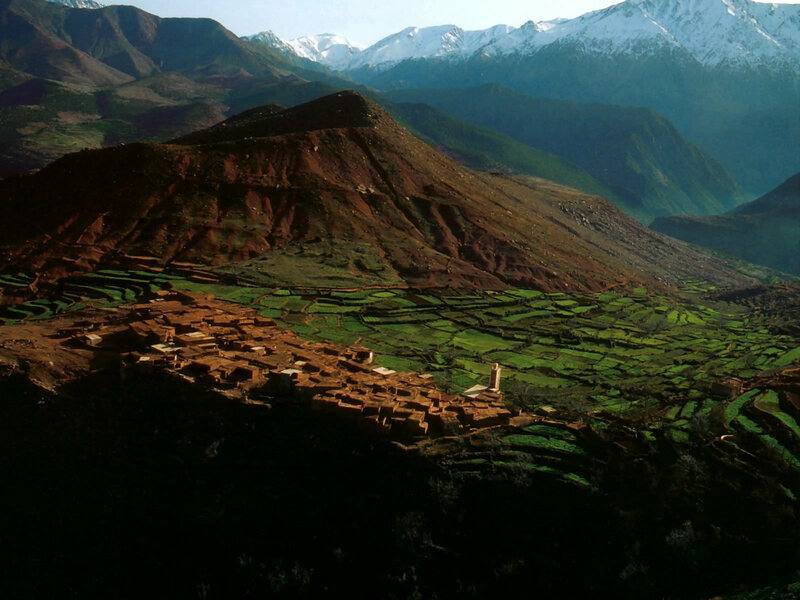 Toubkal and the village of Imlil offer scenic activities for hikers on a day trip from Mararkech. A day hike at Mount Toubkal allows for trekkers to explore the region's varied peaks and have lunch in a Berber village or at Kasbah Toubkal with views. The village of Imlil is small and windy with local shops selling Berrber silver jewelry and Moroccan goods. Filled with street cafes and guests houses, Imlil is a good refuge for hikers. 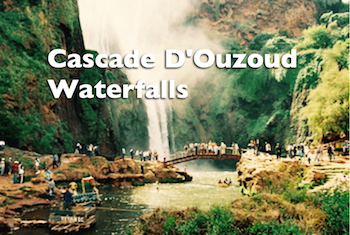 Cascades D'Ouzoud Waterfalls The Ouzoud falls, just a few hours from Marrakech boasts three tiered beautiful waterfalls and a lush valley. Ouzoud offers many trekking options. Visitors can take a wooden paddle boat trip at the bottom of the falls or a cold dip in the falls which makes for a charmed experience. Outdoor cafe stands conjure up the atmosphere with fresh cold orange juice and Moroccan snacks. A favorite of Marrakechi's, picnicing at Ouzoud is also popular in spring and summer months. For Morocco travelers who have more then a day trip from Marrakech available, an overnight stay can be arranged at a Berber guest house. The Berber guest houses in Ouzoud are secluded with spectacular views, local cuisine and Moroccan hospitlaity. Oukaïmeden Oukaïmeden is Africa's highest peak for skiiing and a Morocco premiere ski resort. Oukaïmeden village is perched on Jebel Attar and just an hour from Marrakech. Adventure seekers and skiiers can enjoy Oukaïmeden's windy slopes and chair lift to ferry them across the Atlas. Local cuisine is available at many of the Ski houses nearby, year round. Off season Oukaïmeden makes for the pefect getaway given its cooler temperatures and remote Atlas Mountain scenery. The region of Oukaïmeden is also known for its history of prehistoric rock carvings. The local musuem in Oukaïmeden provides more information on this and visitors can also explore with their Moroccan guide to discover rock carvings in the surrounding area. Essaouira Medina This former Portuguese fished village once called Mogador is just three hours from Marrakech located on Morocco's Atlantic Coast. Essaouira has lovely white washed and blue-shuttered houses that create a scenic backdrop of coastal romance. 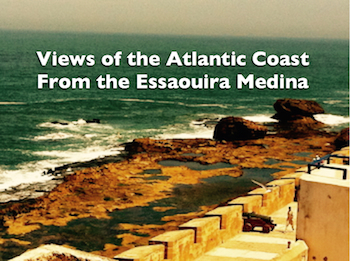 Essaouira's seaside medival medina offers mouth watering seafood, thuya workshops and art galleries. A hippy colony with chic restaurants that cater to foodies, Essaouira is ideal for contemporary gastro-fare and a great place to enjoy sunset cocktails. The Essaouira medina is only 8 kilometers from the Ounara winery and a Frommagerie where travelers can learn cheese making or enjoy a five course menu of cheese inspired dishes. The Essaouira medina as a Morocccan day trip from Marrakech is a layed back option for couples, small groups and families. Even if your trip to Morocco is mainly centered around the major cities, it is worth getting out for a day into the countryside to see rural life. Although the majority of the Moroccan population now officially lives in urban areas, many retain an attachment to the land and their native town or village. It is worthwhile, therefore, seeing Moroccan life in a different context, as it is still lived by many people. Despite increasing urbanization, the agricultural sector in Morocco still employs around half of the workforce and there is nothing quite like the hub of activity on a Moroccan market day! On any day of the week, a market (or souk) will take place somewhere in each Province (a region like a State in the US or a county in the UK). The souk often takes place in one of the larger towns or in a village which acts as a hub for the surrounding rural area and local farms. 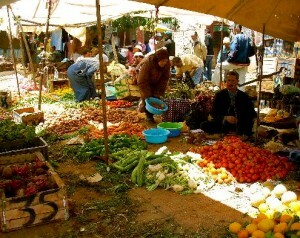 The weekly market is so ingrained in local culture that many towns include the day of their souk in their name. Take a look at a map of Morocco: any town with "el had" in its name has the weekly souk on a Sunday. Likewise, "khamiss" means the market is on a Thursday. By visiting local souks outside Marrakech you can experience local Berber country life and absorb the character of the marketplaces where they meet each week. This is an important social occasion where local producers sell their wares including, fruit, vegetables and livestock. Merchants from Marrakech sell essentials such as: tea, coffee, sugar, packaged foods, cooking items, clothing and electronics. You can also come across carpets, jewelry and pottery generally cheaper than in Marrakech. There are many things available to buy from the souk: henna, spices, rugs, Berber slippers and sandals, pottery, Berber djellabahs for men, dresses for women and handmade wooden kitchen utensils. Amizmiz has the best Berber souk in the region on a Tuesday as well as sampling the local wares, it is a good starting off point for treks in the surrounding Atlas Mountains and meeting the Berbers in their home environment for mint tea and a meal served in their homes. Set against the majestic backdrop of the High Atlas, the picturesque village of Tahanaout attracts visitors with its landscape and attractive sturdy Berber red clay buildings. The village which is 30 km from Marrakech is surrounded by olive groves, orange and lemon trees. Its souk is also held on a Tuesday. Pottery making and cooking demonstrations are on offer from the inhabitants of Tahanaout, you can learn how to make homemade bread, makoda, couscous and other traditional regional dishes. There are good opportunities for bird watching whilst strolling along the riverbanks, where you can see Moroccan wagtail, white stork and cattle egret. You can trek to the Ouirgane, N’Fis and Ourika Valleys and the waterfalls at Setti Fatma. You can also ride donkeys or hire a 4X4 cross country vehicle. 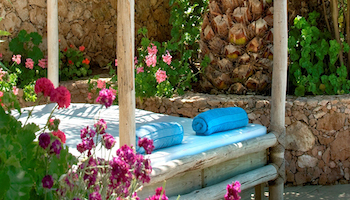 If you want to stay in Tahanaout you can book into the Terres d'Amanar an extensive eco lodge with gardens and stunning mountain views on the outskirts of the village. The Kasbah Angour is also nearby both establishments can arrange local tours including trekking on foot or by donkey and 4x4 overland vehicles for further afield . Other centers for weekly souks include Tnine Hem on Monday, Sidi Ghiat on Sunday and Aghmat with its ancient ruins on Friday. Asni also has a large market on Saturday, Ijoukak on Wednesday and Khemis Ouirgane on Thursday. Ouirgane itself is a delightful place to spend a few days for trekking and relaxation. It is close to the Tiz N’Test pass, Mount Toubkal, Toubkal National Park and the Tassa Ouirgane National Park. This is trekking and ecotourism country at its best. It is possible to travel around by 4x4 but if you are up to it by foot, donkey or horse is best. The air is clean the mountain scenery and the Takherkhoute forests are enchanting. One of the of the best places to stay in Ouirgane is the idyllic Domaine de la Rosaraie, set in sixty acres of parkland with a large garden filled with roses . 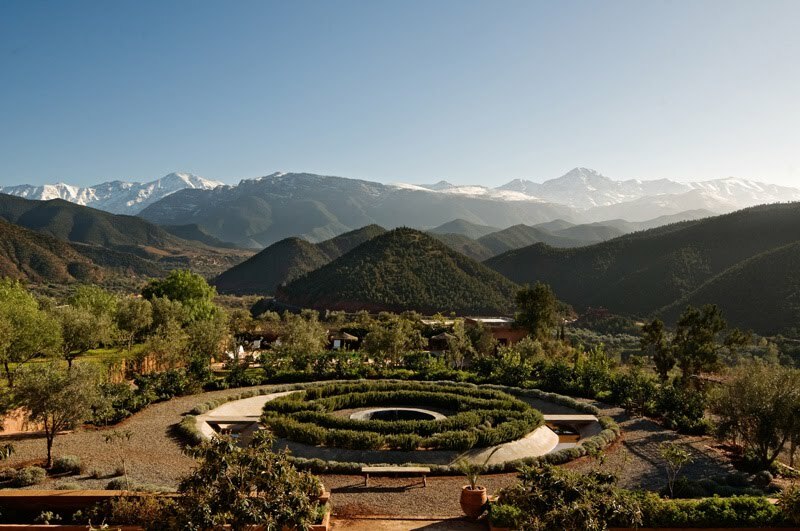 Domaine Malika is new on the scene in Ourigane and for an upscale and chic mountain experience there is none better than the Domaine Malika. . Chez Momo is a charming auberge, Moroccan country style home overlooking the High Atlas. 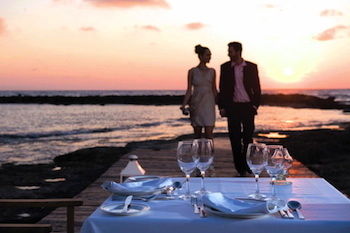 They are also known for the excellent cuisine and elegant dinner setting. If staying in Ourigane dining at Chez Momo is a must. Au Sanglier Qui Fume has been in existence since 1945. It started by catering to Foreign Legion soldiers working on the bridge and acquired its distinctive name because it was used by wild boar hunters. Its restaurant has great character including the heads of wild boar hanging from the walls. The food is a blend of French and Moroccan cuisine. It remains a classical French establishment. The Tassa Ouirgane National Park and the Toubkal National Park provide great trekking opportunities in amongst the valleys and local Berber villages hamlets and fields with the Atlas mountains towering above them. You can visit the salt mines at Marigha. Here the Berbers have been mining salt by their traditional method unchanged for centuries. They transport the salt by donkeys and sell it locally. In the village of Tnine in the Ourika valley Nectarome has an organic garden with aromatic plants and medicinal herbs where their products are created and a shop selling a range of soaps, shampoos aroma therapy and massage oils. 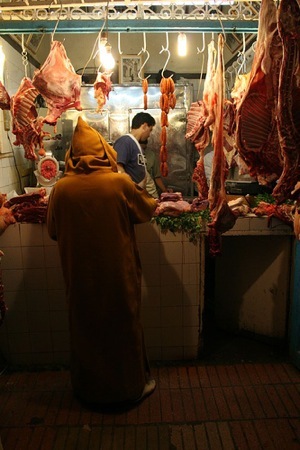 There are also several outlets in Marrakech and Casablanca. The company has a team of experts in essential oils and pharmacy. 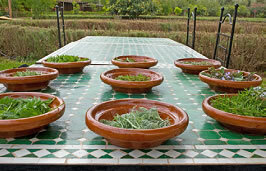 Nectarome combines ancient Moroccan traditional cosmetic formulas with the modern aromatherapy using essential oils and phytotherapy techniques for natural body and wellness treatments, with massage with oils. The famous Argan blended with other essential oils with moisturizing properties and essences such as almond or sesame oil. A range of soothing body lotions including rose,green tea and neroli (orange blossom) are available at their Ourika valley location. The soaps are based on essential oils such as Argan, Almond, Nigella and Ghassoul in addition to various glycerine soaps, Verbena, grape fruit, orange blossom, Amber, Musk and Rose. There are also liquid soaps such as cedar and orange. Rose water and orange blossom water are used for toning and regenerating skin and perfuming the body and clothes. Face masks can help smooth wrinkles and anti aging with honey and essential oils and a gelling mask, natural clay face masks and cleansing masks. There is a range of natural bath oils with eucalyptus and rosemary which helps to tone and relax the skin. Bath salts help to detoxify and purify the skin. Natural shampoos without chemical additives benefit the hair and scalp and treat dry or oily hair. Nectarome products also include shower gels in rosemary of bitter orange and a range of natural scents such as mint, tangerine and cinnamon. The famous ancient black soap called beldi, is a mixture of olive and argan oil water and salt and is used in the massage to prepare the body for scrubbing and removing dead skin with a special horse hair glove. Ghassoul, is a typical Moroccan clay, it is a deposit in the region of Fes . This clay is used in Morocco, mainly by women since the 12th century as a shampoo and skin cleanser. Nectarome also provides natural henna recommended for skin infections and eczema, with restorative properties for skin and hair as well as decorating the hands and feet in traditional berber style. Nectarone cautions against henna with chemical additives which can be harmful to the skin. The Ourika valley is 30 km from Marrakech and is one of the best places to visit in Morocco for hiking in the Atlas Mountains and seeing its unique countryside. Getting there by grand taxi of bus or one of the many tourist travel companies is easy. The valley starts at Souk Tnine de l'Ourika leading on to the village of Arhbalou then on to Tazzidfount leading up to the trekking area of Adrar Yagour which has prehistoric rock carvings. trekking further afield ahould be undertaken with a guide,equipment and proper planning. Trekking is easily arranged in the Ourika Valley, and can be anything from a day’s walk into the foothills to a trek lasting several days. It is unsurpasssed for natural beauty and its terraced hillsides lead off into a world of adventure amongst the local villages of mud bricked walls. There are numerous walking trails weaving their way through the valley.Trekking in the valley can involve a variety of activities including rock climbing, birdwatching and mountain biking which is especially popular on the roads through the forests of the Toubkal Natural Park. The ruins of the kasbah Dar Caid Ouiriki the origninal house of the Caid of Ourika across the valley from the souk of Tninede l'Ourika at the entrance of the valley beckon as a first trek among the poplar trees and weeping willows and the lush green fields and farms. There are again numerous expeditions that you can enjoy walking from the Kasbah Bab Ourika, which is amongst the best accommodation in the area from short strolls through villages and aromatic gardens to longer hikes taking in forests and rivers.There are numerous expeditions that you can enjoy walking from the Kasbah Bab Ourika, which is the amongst the best accommodation in the area from short strolls through villages and gardens to longer hikes taking in forests, rivers and waterfalls. During the hot summers in Marrakech the valley is an escape to the cooler environs of the Ourika river andthe surrounding hillsides and mountains. The fields and livestock provide a living for their families and the trekker can experience their daily lives walking alongside donkeys and carts, with little children playing in the fields. To trek and absorb the imposing majesty of the surrounding mountains Setti Fatma 20 kms upthe valley is the gateway to the mountain ranges. There is an important four day moussem festival in August in Setti Fatma which is a very colourful and lively event with its souks selling traditional fare. Passing by the shrine and the waterfalls you can walk out on the stone tracks amongst the mountains of the High Atlas.The summit of Jebel Toubkal(4,167 metres) the highest peak in North Africa towers above the valley.It is possible to trek to Mount Toubkal via Setti Fatma to Timichi and Oumkaimeden, it takes about 5 hours.The more usual appraoch to Jebel Toubkal is via Asni. Othertreks from Setti Fatma include Adrar Meltzen via Tourcht and the Oued Zat region by the Tizi n'Tilst. There are numerous trekking routes but these are quite arduous and trekkers should be fit and accompnied by a guide.These include the Taska n'Zat-Arjout peaks and the Tizi Tzarzit. The chance to meet the mountain people in their enchanting rural communities adds to the experience which can be experienced during a day trip from Marrakech. 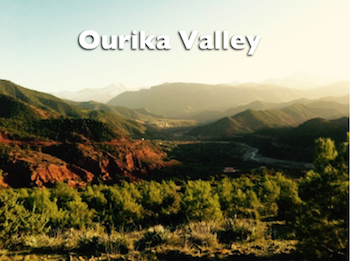 The ski resort of Oukaimeden is the other main tourism location in the Ourika valley. On a good day the views over the plains surrounding Marrakech can be stunning.The resort has a number of ski slopes and hotels.The period for sking is February to April. There are walking trails from Oumkaimeden but these should only be attempted during the summer season because of snowfalls in winter. The three hour trek to Tachddirt is relatively easy. The world of the mountainpeople and their villages is a complete contrast to the life of the cites and villages of the plains. 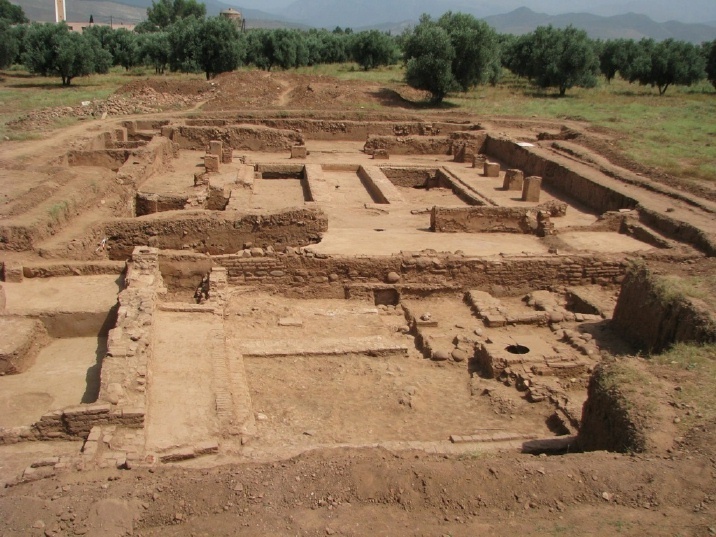 The Medieval site of Aghmat can be found beside the modern village of Ghmat which is 30 km south east of Marrakech in the northern foothills of the Atlas Mountains in Morocco. Professor Ron Messier, Professor Emeritus Middle Tenessee State University and Senior Lecturer in history at Vanderbilt University and his codirector Professor Abdallah Fili faculte des letters Universite d’El Jadida have been following a trail of gold a it was part of the camel caravan routes from sub-Saharan Africa through the ancient city of Sijilmassa which Ron Messier’s team excavated through to Morocco’s Medieval Capital, Aghmat. Coins minted in Sijilmassa have been found in an excavation in Jordan and Aghmat too minted coins for the Almoharavid empire which stretched into Spain. 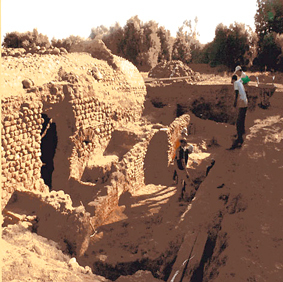 The international archaeological program has been studying Aghmat Since June 2005 Medieval texts suggest that Aghmat existed before advent of Islam in the 7th Century. It flourished under the Idrissids in the 8th and 9th centuries and attained the rank of an Amazight city state in the late 10th Century. 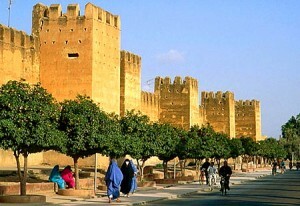 It became a capital under the Almoravid dynasty from 1056 to 1070 when the Almoravids moved their capital to Marrakech. Aghmat gradually declined in competition to Marrakech. It was an important city for routes through the Atlas Mountains on the trans Saharan trade and attracted scholars from Ifriqiyya (Tunisia) and Andalusia. The site contains the tombs the Andalusian kings al-Mu’tamid ibn Abbad of Seville and Abdallah ibn Bulukhin of Granada. Zaynab Nafzawiyya settled in Aghmat married three successive rulers,the independent Maghrawa emir and the first two Almoravid emirs. Aghmat consisted of two towns Aghmat Ourika and Aghmat Haylana home to Bani Masmuda tribesmen. It was a rich city fully irrigated and minting gold currency for the Almoravids. In April 2007 the Aghmat Foundation was founded by a group of patrons under the leadership of Moulay Abdellah Alaoui to provide financial support for further excavations and the construction of a museum for the artifacts that have been found and for conservation and preservations of the excavations.In 2009 a partnership agreement between the Aghmat Foundation and the Moroccan Ministryof Culture which delegates to the Foundation matters of managing archaeological research, conservation and protection of the excavated remains and the opening of the site to the public. 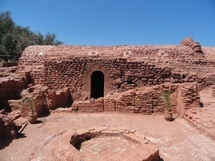 It is easy to visit the site of Aghmat close to the village of Ghmat and the archeological work is a testimony to the close cooperation between the Moroccan Ministry Culture and The United States. Excavation work continues each season and Professor Messier is working hard to achieve more sponsorship to support the continuing discovery process, which is more difficult since 2008 during the current economic downturn.